Plastic wristband unlike the name, is extremely light, which has three characteristics: waterproof, moisture, shock which resistance to high temperature. It’s made of a strong, comfortable, no stretch, and no rip plastic. It’s closed loop type wrist strap that means very flexible, easy to wear and convenient to use. They’re stretch-resistant, water-resistant and even more durable than Tyvek adhesive wristbands , suitable for events longer than 1-2 days , with a permanent snap closure able to accommodate nearly any wrist. All of the plastic wristbands come with a snap closure that must be destroyed to remove it or using a scissor to cut it off from your wrist if you want to take it off. Plastic wristband is the most popular wristband in the market. The regular sized plastic wristbands are the most generally used bands and are great for multiple day use. 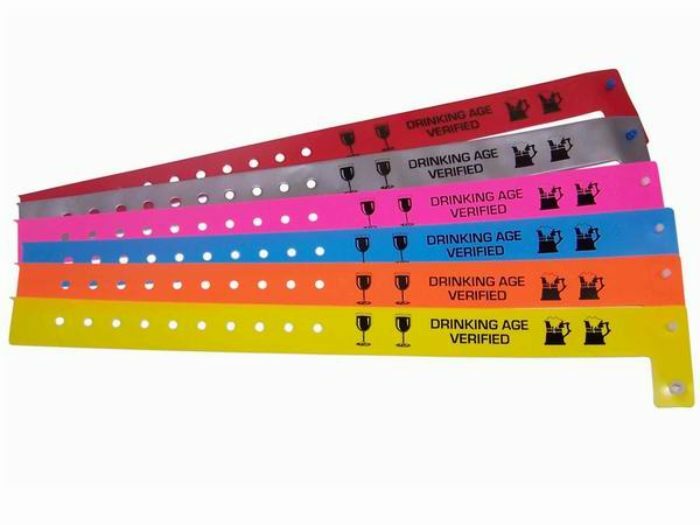 They offer a sizable printable wristband space for personalized logos, text, or graphics.You can widely use to swimming pool, field operations and such wet environment, don’t need to worry about it’s waterproof function. Then our custom plastic wristbands are an excellent choice for that extra boost of security and promotion you’re looking for.